What is a Mingling Maven? Life is full of business networking events, social situations and life’s celebrations. Knowing How to Work a Room® is essential. – A database does not a network make. Watch these videos to learn the latest and greatest ways to meet, mix and mingle. Wouldn’t it feel great to be able to walk into any room whether full of strangers, business colleagues, fellow alums or even family and circulate, converse, connect and leave a lasting impression? Most of us want to be memorable, comfortable, respected, interesting, conversant, approachable, and exude confidence. What will it take for you to have Mingling Maven® Know-How? – RSVP and say YES! – Know How to Work a Room® with charm, warmth and pizzazz. – Be timely – No Grand Entrances! Do you need to learn the ways of Mingling Maven® Know-How? Susan RoAne, the Mingling Maven, will individually consult with you. She will assess your mingling/socializing skills and will design a personalized program based on your goals and provide proven strategies for your Mingling Maven®-hood. Does your organization or company need a mingling skills tune-up? 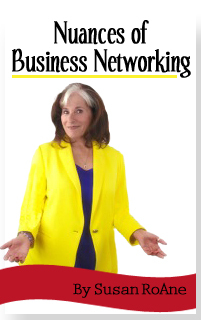 Susan RoAne will keynote your meeting or conference and provide attendees with the strategies they’ll need to mingle, socialize and network face-to face comfortably, effectively and productively. And impact your bottom and top lines! She can teach you How to Work a Room®!